I will be comparing the DESTEK V4 VR Headset and the Homido V2 Headset. The reason I chose to compare these two virtual reality headsets is because they are both very similar in price and durability according to Amazon (2018), but we will see if this is actually true. Customers want to know if they are actually getting the product they are reading in the description, which is why I will be looking in depth at both products. 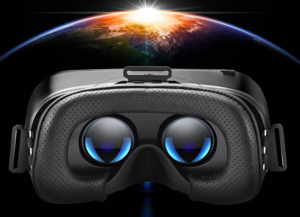 DESTEK V4 VR Headset was released in 2017, and it is on the market for $33.89 on Amazon, but other companies vary within the $5 range of that price. This camera is made by DESTEK and is very affordable/ available among many websites. This headset is even cheaper if it is purchased without the Controller/ Gamepad. Yet the controller is a bluetooth controller that allows you to immerse yourself in arcade games! This headset also obtains Eye Protected Anti-blue Light HD Lenses to ensure safety while using them. The Homido V2 Headset was also released in 2017 by Homido, and when I purchased the headset in August it was only $22, but since then the price has raised on Amazon and other websites to at least $31.98. This product is still very affordable either way, especially since it comes with a strap so you don’t have to hold the headset to your face. I was also very pleased that the headset came with a case and cloth to keep it clean. 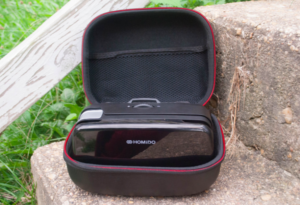 Since, I personally own the VR Headset Homido V2 I was able to see the headset for myself, and it is more compatible for all smartphones because of its easy phone adjustment. It also obtains adjustable lenses to get as clear of vision as possible in the virtual world, plus it is comfortable to wear since it also has an adjustable strap. The cons of this product is that I realized it still gives a blurry look to the highest of quality videos and there are no standard control system. Although I do think you are getting what you paid for! 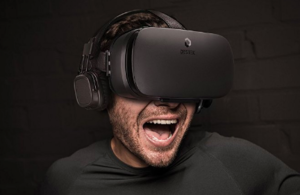 The DESTEK V4 VR Headset is known to have pros such as being AR compatible, easy focus adjustments and to be also extremely comfortable to wear, but it does seem to have some cons such as its design flaws because there is some light leak and the clamp doesn’t always work to its best ability (Sean, R., 2017). DESTEK V4 VR Headset and the Homido V2 Headset are both used in the same way, you place your phone inside the plastic covering in the front and then put the headset over your head. 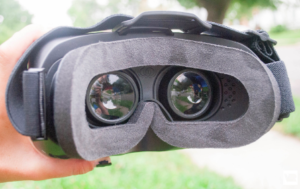 You must make sure the video you are watching is set to VR mode, because if not you will not be able to see the video very well and it could make you nauseated. I see this product being used for anyone that is wanting to start learning about virtual reality but is unaware if they should purchase an expensive, high quality headset. Although, both of these headsets seem to have great quality for the price they are currently at, so either way you can’t go wrong! 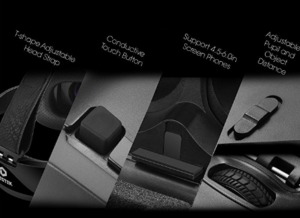 After research, I would say you get more for your money with the DESTEK V4 VR since it comes with more features and tangible items. Although this headset is meant for augmented reality. If you are just looking for a decent headset to watch only VR videos on, but are not looking to spend a ton of money I would definitely recommend buying the Homido V2 headset.